Apple didn't buy airtime during America's National Football League 2016 Super Bowl, but some of its products did turn up playing a cameo role in a variety of commercials. A spot for T-Mobile featuring Drake ended with a promotion of the carrier's unlimited "stream all you want" music feature that specifically called out Apple Music, spelled out with the Apple logo. App developer Machine Zone presented an ad for its game Mobile Strike featuring Arnold Schwarzenegger wielding what appears to be an iPhone 6 (although most Android phones now look exactly like an iPhone, too). The ad's cover image on YouTube clearly presents Schwarzenegger holding an actual Apple device however. 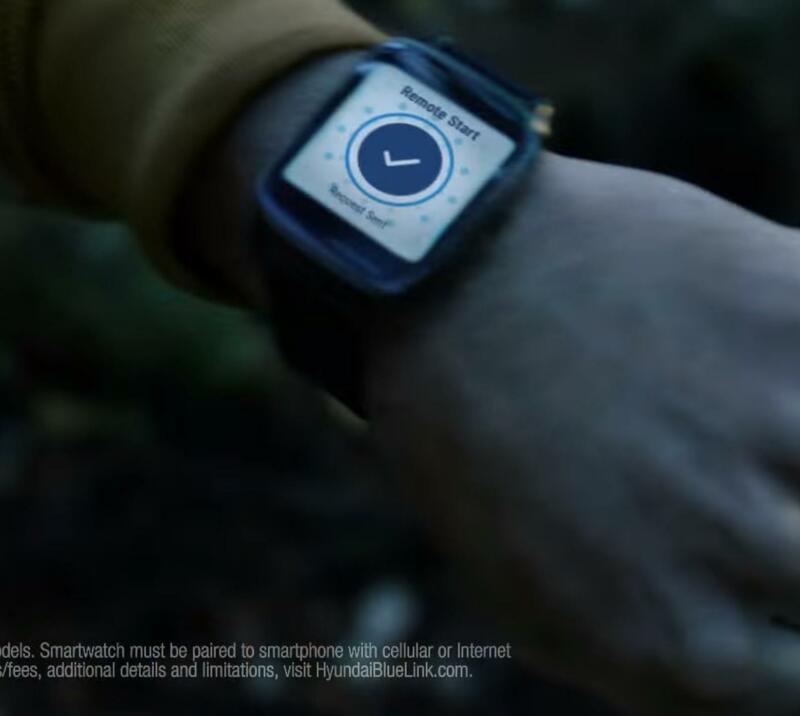 While activity tracker FitBit paid to promote its new Blaze smartwatch in an advertisement, what appeared to be an Apple Watch was featured in spots by Hyundai showing off the company's Bluetooth automotive system called Blue Link, which enables remote start, unlocking and other features from smartphones and select smartwatches (although not the FitBit Blaze). In one commercial, two people being chased by bears in the woods are saved by a watch-based voice command to start the car, allowing them to narrowly escape. 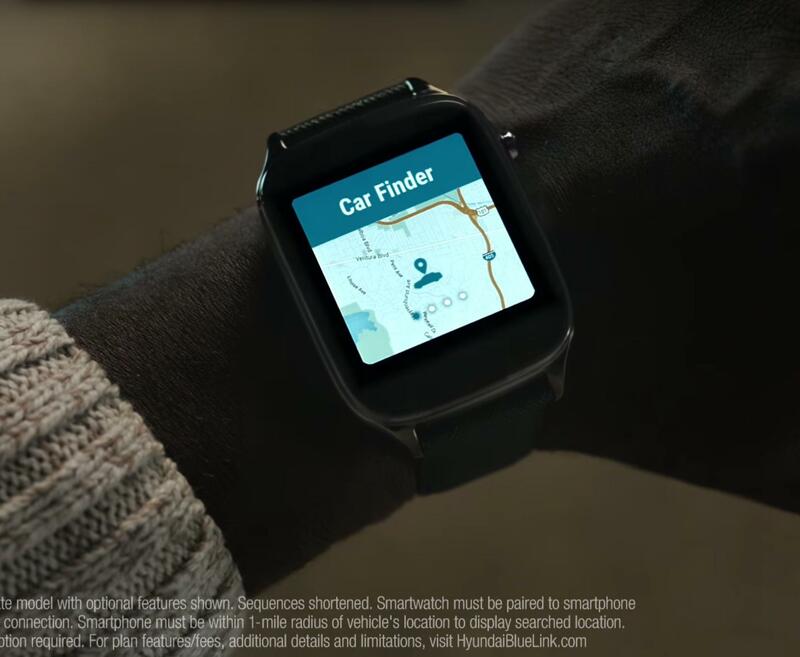 Hyundai's system supports both Apple Watch and Android Wear devices, but the commercial briefly depicted a rectangular display, while on company's website Android watches are shown as being round. Despite arriving years after several generations of Android or Tizen based smartwatches, Apple Watch has greatly outsold all other smartwatch products on the market. According to estimates by Jupiter Research, Apple Watch accounted for more than half of all sales last year, and featured over 10,000 apps, compared to less than half that many available for Android Wear devices. A second car commercial, for the Kia Optima, featured Christopher Walken appealing to a man to wear distinctively colored socks, then segues in the man's walk-in closet to reveal a car that is presented as being as exciting as socks with some color on them. Upon stepping into the car at Walken's request, a prominently large in-dash display is visible. Kia's 2016 Optima is its first model supporting Apple's CarPlay smartphone integration, and although the ad only depicts the system's default UVO screen, the appearance is enough to imply that CarPlay is a desirable option. In January, GM dealers were cited in a report by the Wall Street Journal as stating that CarPlay was a option customers were directly interested in, and credited the feature with helping to sell new cars. CarPlay was also awarded by Autoblog as the 2016 "best individual technology feature in a vehicle." A Super Bowl-related spot for Apple's Beats subsidiary did not appear to air during the game, but was promoted on Twitter and YouTube. It featured NFL MVP and Carolina Panthers quarterback Cam Newton wearing a pair of Powerbeats Wireless 2 sweat resistant headphones while working out, with titles promoting rapper Future's new album Evol, which it notes is exclusively available on Apple Music. The spot, named "Cam's Prayer," recites the words, "you placed purpose on my shoulders so now i come to you. Lord, give me the strength to finish this, my way." 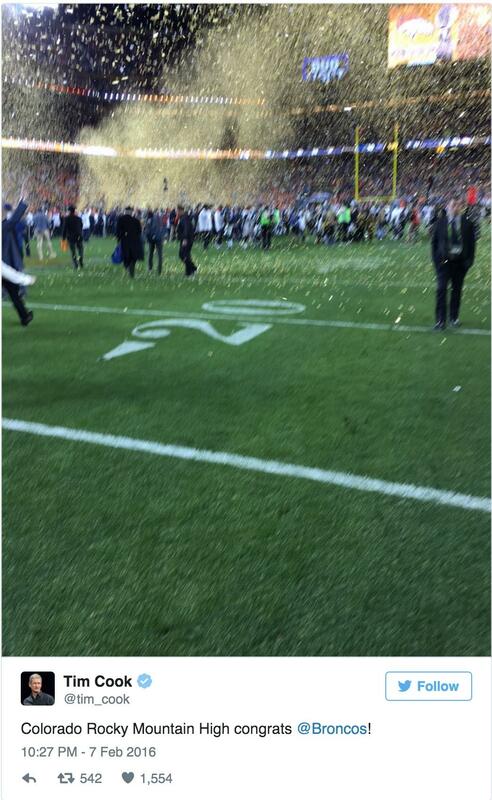 However, the Panthers lost the Super Bowl. Apple did contribute $2 million to help finance the Super Bowl Host Committee this year (along with several other Silicon Valley firms), as the game was held in Santa Clara, California, which is located near Apple's headquarters and virtually adjacent to new properties the company has recently acquired. However, the company turned down the rights to use the organization's branding for promotional purposes. Apple most famously delivered the iconic and highly regarded "1984" Super Bowl ad used to introduce the original Macintosh 32 years ago. It followed up the next year with "Lemmings," a poorly received commercial for "the Macintosh Office" that bleakly depicted PC users as blindly walking off a cliff to their deaths. The company didn't advertise in the Super Bowl again until 1999, when it presented a plodding spot featuring the psychotic HAL 9000 computer from "2001: A Space Odyssey," reciting how Macintosh computers survived the Y2K apocalypse because they were designed to deal with four digit years, unlike many computing systems prior to the new Millennium. Steve Jobs apparently liked the ad well enough to bring HAL onstage for an awkwardly weird appearance during a Macworld Expo keynote address, showing off the PowerMac G3 running head to head against a Pentium II PC in a Photoshop shootout. (although most Android phones now look exactly like an iPhone, too). The ad's cover image on YouTube clearly presents Schwarzenegger holding an actual Apple device however. Really Daniel? Most android phones look like an iPhone, is that because they are rectangle shaped, with rounded corners? At the time that Apple introduced the iPhone, the flip phone was the popular design, which immediately fell out of favor for the candy bar, a rectangular phone with rounded edges, with a full size screen, edge to edge, which used rounded square app icons, email & Internet surfing capabilities.... well they just looked like the iPhone. The Android OS which was based on a mobile phone OS that Google had acquired & resembled a typical mobile phone OS was redesigned along with the reference phone to mimic that of the iPhone. So smartphone designs took on the look & feel of the iPhone. The Hyundai ad showing the apple watch won best ad of the game. 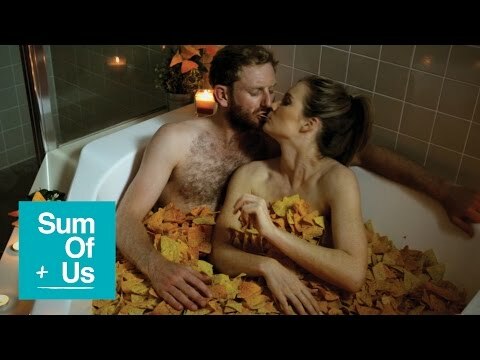 This year's ads were pretty weak, however the Dorito's ad with the ultrasound of a baby was outrageously funny. Interestingly, their later ad featuring dogs trying to scam Dorito's from a retailer was not good. It made me think Dorito's must be dog food. EVERY 'droid looks like an iPhone. THEY ARE KNOCKOFF PRODCUTS. All the denial in the world will never change this. Rectangular phones with rounded edges and big screens ARE EXACTLY why. What more are you asking for? Are you too young to remember when everyone's phones looked unique? 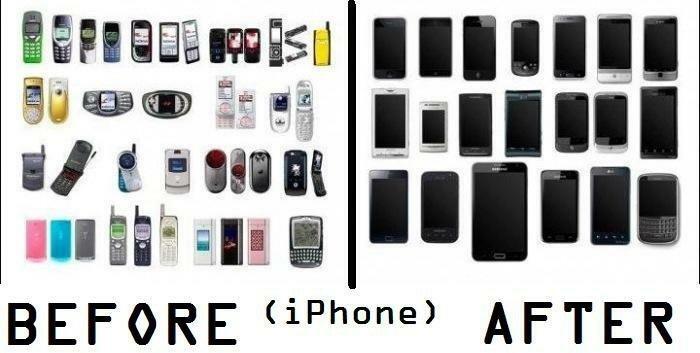 After iPhone everyone threw design and innovation in the garbage. Yep, those Hyundai commercials were definitely featuring Apple watches. Deleted because of my duplicate post and because Chrome and this forum don't get along (wonder why). Pretty sure that was runbuh's point...? Really Daniel? Most and d phones look like an iPhone, is that because they have rectangular shaped, with rounded corners? And what, no other design was ever copied? Did you boo hoo and belly ache when the flip phonee was copie? Did you moan and groan when the candy bar was copied? Did you go around kicking cats and dogs when the physical keyboard smartphone was copied? If not, then why not? Ah, so you do agree it was copied. Perhaps you should re-read the original post. Puppy-monkey-baby. My gawd that ad was terrible. It's a bit blurry. He must've been walking or running at the time. Considering the LG Prada and original iPhone were announced around the same time it's pretty clear the candy bar form factor would be the direction phone makers moved in. I have a hard time believing people here really think were it not for the iPhone we'd all still be using flip phones or blackberry type devices. And as far as copying, others had bigger screen devices on the market before Apple did. Was Apple copying when they released the 6 and 6 Plus? The problem with Samsung wasn't about rounded rectangles it was that they went through every piece of the iPhone interface and replicated it. That's copying. No, "most" Android phones don't look like iPhones. Besides that being a difficult thing to quantify (really, you've looked closely at hundreds or thousands of Android phones? ), it's based on a flawed premise: that virtually any touchscreen-only phone is copying the iPhone. Yes, Apple was instrumental to popularizing the concept, but it's not as if a full-touch phone was a completely novel idea in January 2007. A device looks like an iPhone if it apes specific design cues, not if it's all-touch. An HTC One A9 is conspicuously imitating the iPhone (even if the iPhone 6/6s borrowed some HTC elements); a Moto X Pure Edition, LG V10 or Sony Xperia Z5 is not. The sooner we accept this, the sooner we embrace a more intelligent, nuanced form of fandom. Daniel's "all companies owe everything to Apple!" stance doesn't help anyone.